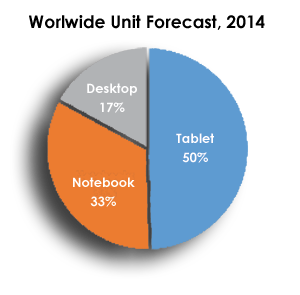 In a recent report the International Data Corporation (IDC) advised that they expect tablet shipments to surpass total PC shipments (desktop plus portable PCs) in the fourth quarter of 2013 (4Q13). PCs shipments are still expected to be greater than tablet shipments for the full year, but IDC forecasts tablet shipments will surpass total PC shipments on an annual basis by the end of 2015. This forecast has been echoed by a number of other market studies . For a fascinating collection of facts and insights regarding tablet use and penetration, click here. For greater insight about tablet sales, users and usage, read this collection of statistics from the Tab Times. PreviousPrevious post:iBook ShowcaseNextNext post:What is CD Extra?